Under the Empyrean Sky (Heartland Trilogy #1) (Paperback) | Let's Play Books! Corn is king in the Heartland, and Cael McAvoy has had enough of it. 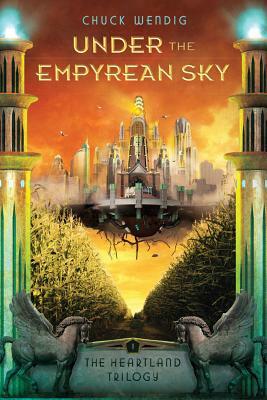 It's the only crop the Empyrean government allows the people of the Heartland to grow -- and the genetically modified strain is so aggressive that it takes everything the Heartlanders have just to control it. As captain of the Big Sky Scavengers, Cael and his crew sail their rickety ship over the corn day after day, scavenging for valuables, trying to earn much-needed ace notes for their families. But Cael's tired of surviving life on the ground while the Empyrean elite drift by above in their extravagant sky flotillas. He's sick of the mayor's son besting Cael's crew in the scavenging game. And he's worried about losing Gwennie -- his first mate and the love of his life -- forever when their government-chosen spouses are revealed. But most of all, Cael is angry -- angry that their lot in life will never get better and that his father doesn't seem upset about any of it. Cael's ready to make his own luck . . . even if it means bringing down the wrath of the Empyrean elite and changing life in the Heartland forever.